No Comments// Posted in e-classroom, english, english literature, ICT, learning, teaching, vocabulary, writing by Nor Fadzleen Sa don on 09.30.17. One of the main challenges for students in writing is lack of vocabulary, specifically in describing an object or situation. 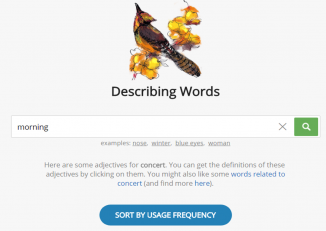 I’d like to share two cool websites that anyone can use to assist them in describing words more effectively. For teachers, you can facilitate the students to choose suitable words from the list of websites provided. However, they can be helpful for independent learning as well. Hope it helps! I like this website as it would be useful for anyone from beginner to advance as we might need a bit of vocabulary nudge to describe a person/thing/situation. Just key in the word and voila! You’ll get as many as 100 possible words! The end-user can customize the answers based on usage frequency or uniqueness. Say goodbye to the boring way of learning and remembering new words! 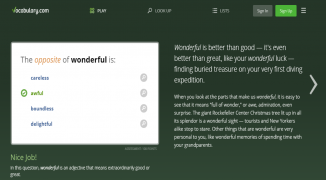 Vocabulary.com emphasizes contextual learning where learners understand the meaning and context of the words rather merely memorizing it. It teaches you words by systematically exposing you to a wide array of question types and activities by embedding the elements of games and quizzes. Not sure how to test your students’ understanding on the novel/text you’re teaching? Paste up to 100 pages of text into the box and a learning activity will be generated for you to assign to your students. Do check it out!